I recently watched Julie & Julia for the first time, which is surprising considering it came out 4 years ago and it is a movie about cooking. While I wasn’t a huge fan of Julie (whiny and overly obsessed with Julia Child), I enjoyed the movie as a whole because Julia Child was pretty funny. It inspired me in two ways: go to Paris someday and get Mastering the Art of French Cooking. Don’t worry though- we will not start giving all of you recipes for things like meat aspics, which are gelatin with various ingredients set in them. I appreciate the various rainbow of fruit jellos (topped with a little whipped cream), but savory ones? No thank you. I can’t imagine what it must have been like to cook through that whole book in a year. It must have been a lot of rich and fancy food, not to mention expensive and time-consuming. As you can probably see from our blog, we appreciate the occasional unique food item and always like a kitchen challenge, but we also like to make some lighter and simpler recipes as well. This is one of those recipes. While it doesn’t look like much, it is surprisingly delicious. To us, it sort of tastes like a meatless taco. Basically you make a spicy (but not too spicy, do not fear! ), flavorful bean mixture and then load it with all sorts of toppings: lettuce, tomato, green onion, and sour cream. It’s an easy and relatively healthy meal that is perfect for summer! In a small saucepan or a skillet, heat the canola oil over medium high heat . Add the garlic, chili powder, minced chipotle chiles, cumin, salt, and cayenne pepper. Heat for about 30-60 seconds or until fragrant. Add the beans and water or broth. Bring to a boil, then lower the heat to medium-low and let simmer until thick, about 10 minutes. Remove from the heat and lightly mash. Stir in the salsa. Spread 1/3 cup of the bean mixture down the center of a tortilla. Top with cheese, lettuce, tomato, green onions, and sour cream. 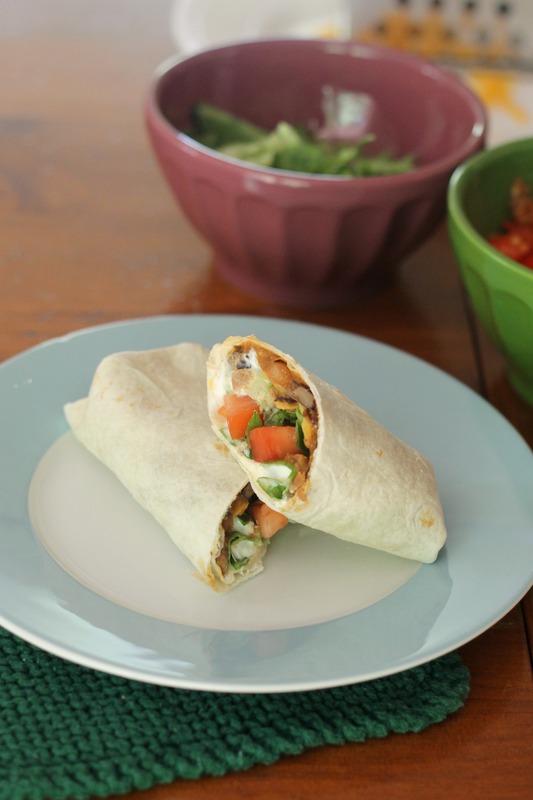 Roll it up burrito style, cut in half, and serve. Enjoy!